I wish I could travel back in time, and talk to this lady, my great-great grandmother on my mother's side. She experienced so much of life's hardships during her 55 years. And yet she saw some of the country, worked as a seamstress, raised a number of children. I wonder what she looked like? In 1841, the Frost family consisted of father John, mother Elizabeth, son William and daughter Sarah. They lived on Mill Street, Leicester, about a mile's walk from their previous home. By 1851, they were living at 12, Denham Street in Leicester, another street that no longer exists. It was the next left turn after Manitoba Street, going north on Christow Street, back in the area of Wharf Street. 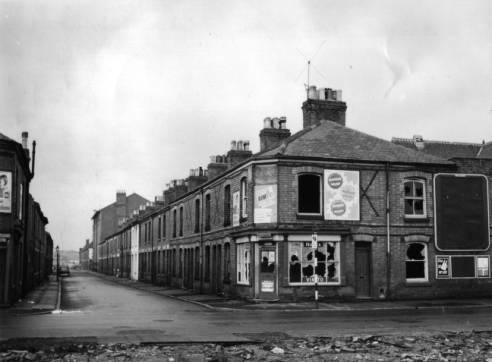 Important to remember: this was a time when the "slum" housing, the streets of terraces in Leicester, were just being built. The homes were all new! In 1851, the household contained Sarah, her parents, a new "brother" Richard, and Sarah's baby, William Frost, aged eleven months. (Richard Frost is listed as the son of John and Elizabeth: he was Sarah's son, born when she was seventeen years old. He later takes the name of Sarah's husband, Bonnett, but returns to Frost by the time of his marriage to Eliza Worthy, where his father's name is listed as "Fr N K", father not know.) So far, I have not found documentation of his birth or baptism--unlike the baby, William Frost, where there is no doubt at all that he is Sarah's son. Sarah gave birth to William on 17 April, 1850, in the Union Workhouse, Leicester. There is no father listed on the birth certificate, just an empty space where his name should be. The workhouse was on Sparkenhoe Street, to the north of Conduit Street, and at the time of William's birth was undergoing a major rebuild. Many workhouses had infirmaries for the poor: you didn't have to be an inmate, and as Sarah was back home with her parents and baby shortly afterward, it's likely that she went to the workhouse infirmary to give birth and then returned home to her parents in Denham Street. That's where she was on 30 March 1851... but on 31st August of the same year, she is in Grantham, Lincolnshire, marrying Emmanuel Bonnett. I'd like to think that Emmanuel was William's natural father, and that he'd been sent to Grantham to pursue his work as a blacksmith: in the 1851 census, while Sarah is at home with her parents, Emmanuel is living as a lodger with a baker's family in Grantham, and working as a striker: the person who hits the metal with a big hammer while the blacksmith heats and shapes the item they are working on. In 1841, Emmanual had been living with his father, blacksmith John Bonnett North, on Thames Street in Leicester, about half a mile from Sarah's home. Did they make the baby, and was Emmanuel then sent away to Grantham? Did he take advantage of her, then leave, and did she follow? Or was the baby from another father? Without that time machine, we'll never know. Although railways were becoming established in England in the 1850s, it's unlikely that Sarah travelled to Grantham by train, though it would have been a huge adventure, with steam engines and the brand-new experience. (The Belgrave train station didn't open until 1882, and in the early 1850s, trains in the Midlands were mostly used for transporting coal.) If you compare the speed of travel by horse and cart to a bicycle, it would have taken about three hours to go from Leicester to Grantham, a distance of about 37 miles, passing through some beautiful, rural countryside, maybe travelling along the hilltops to Melton Mowbray, or along the valley through Frisby and Asfordby and Eastwell and then the Vale of Belvoir, passing close to Belvoir Castle. However Sarah, and Emmanuel before her, travelled to Grantham, they were married at the parish church, Grantham, by banns--so a wedding announced publicly for several weeks. Both were residents of Grantham at the time of the marriage, so Sarah must have arrived there a while before. Emmanuel signs with his signature: Sarah, with her mark X.
Sarah and Emmanuel Bonnett's son John was born in Westgate, Grantham, on 28th May,1852, exactly nine months after the marriage. By the time of the birth of son George on 24th May, 1854, the family are living at Cattle Street, Aston, in Warwickshire, where metalwork was much in demand. Sadly, George did not live to be a year old, but died in February 1855. Sons Henry (1855) and Thomas (1862), and daughter Elizabeth (1860) were all born in Aston, Warwickshire. Thomas: another child who did not survive his first year. Infant mortality was so much higher then. So much sorrow... and mothers who had no choice but to continue producing children, year after year, until they either ran out of time, or could survive no longer. Sarah was widowed at the age of 48, when Emmanuel passed away in Leicester in 1878. By 1881 she is living in the home of her son John, at 221 Birstall Street--just across the road from her old home. She was working as a seamstress, a trade she continued through her lifetime. Never believe that women were creatures of leisure!!! She outlived her son Richard Frost--he died in 1882, aged only 35. And most of all... what stories would you tell your great-great-great grandchildren, Sarah Bonnett nee Frost? I wish I had known you. I think you were a fine, strong woman.